for me by me: decisions, decisions, decisions! I am loving all the chat on Artisan Square and seeing everyone's plans. I feel mine are rather confused, especially as I cannot decide upon a wardrobe pattern. So, here are the ones I am considering. I am planning my swap to be a spring wardrobe suitable for going on holiday at Easter. I am thinking of navy, white and lemon as my colour scheme but would also consider adding beige and/or red into the mix. Then again I am also taken with the idea of a black and white theme! I definitely don't want business wear and a lot of the patterns have a formal jacket. I am not too keen on the jacket (too formal) or skirt (too full) but I like the top, dress and wide leg pants. I like the dress and the top, as well as the skirt. Putting them side by side like this has made me realise how similar they are. Wondering if this will be a more flattering design when made up because it is fitted under the bust. My other option is to choose a pattern with basics in it and add to it with more individual pieces. 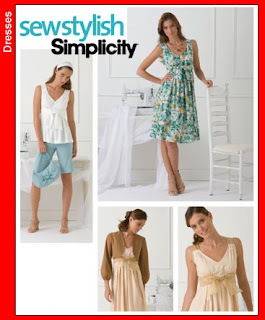 I have actually just purchased this pattern and I have ordered the Sew Stylish magazine in which it featured so this is yet another option.I have not seen the article yet, but Erica B has some photo's of the garments. Difficult decision. For some on the board it seems so easy to decide on patterns/colors etc. I'm still in the preliminary stages of thinking about it all! But all patterns you show have at least 3 pieces that you like, which is the minimum for swap. Perhaps you can see what fabrics you have in your stash that work well with these pieces and are in colors that you want to use in the swap. And remember that a jacket can be more informal if you use a different fabric (if you want to make a jacket at all).